Looking out the hotel window, it appeared to be another warm and sunny day in Daytona Beach for the final round at the WKA Daytona KartWeek Margay Sprint Nationals. Walking out, the wind and cold chill that hit the area said otherwise. Temperatures dropped significantly overnight with strong northern winds coming in, and destroying a number of tents in the paddock. Bringing with it was cold temperatures that stayed throughout the day, only reaching the mid-50s. The nearly 250 entries in nine categories continued on with the event, contesting the second round of the Manufacturers Cup Series and Winter Cup programs. It took exactly 366 days for Brandon Jarsocrak to enjoy the thrill of victory, as the Praga driver swept the action on the day in the KartSport North America Pro IAME Senior division. A year ago, Jarsocrak won the shortened main event on the second day of the Daytona KartWeek, however, this time around he didn’t need a shirtless Billy Lewis and a kart with a stuck throttle spinning around and around in turn one to earn this victory. The KartSport North America driver edged out the field in qualifying, posting a 40.261-lap to beat Day 1 winner AJ Myers (TB Kart) by seven hundredths of a second. Jarsocrak got away from the field to lead all 12 laps of the Prefinal to secure the pole position for the main event. A red flag for a hard hit with the cushion wall in turn one for Lane Vacala, the race resumed with Jarsocrak holding off teammate Jake Donald (FA Kart) through the opening corners. This gave ‘Money’ enough real estate to focus on hitting his marks for consistent lap times. The top challenger was Jonathan Kotyk (Top Kart), climbing from fifth to second by lap seven. From there, the gap remained unchanged through the remaining circuits of the 22-lap event. Jarsocrak notched his first victory in a year, with Kotyk and Austin McCusker (FA Kart) – making a return to karting – joining him on the podium. Myers slipped to fourth with Donald ending up in fifth. Braden Eves once again looked to be the driver to beat in the FranklinKart.com Yamaha Senior category. Eves secured fast time in qualifying today by two tenths (43.557) and was in cruise control in the 12-lap Prefinal until the final circuit. Eves pulled straight to the pit lane after losing a piece of weight, knowing he would cross the scales underweight. Day 1 winner Alexander Kardashian and Dakota Pesek came across the line, and you could almost see the confused look on their faces through the helmet, as the Top Kart drivers finished 1-2 to start on the front row for the main event. The two hooked up and pulled away from the field, with Eves fighting his way forward from the back of the 18-kart field. Lap eight, Eves (Kosmic) was up to the third position, sitting about three seconds back of the top two. They ran nose to tail for much of the race, until they began fighting for the lead on lap 14. This let Eves inch closer until reaching the top two and fighting for the lead. The top spot change the last five laps with Eves leading as they took the white flag. Pesek went for spot with an aggressive move into the downhill turn one, and Eves went wide on the exit, as they went three wide. They continued fighting until Pesek came away with the top spot, and held on to the checkered flag for the victory. Eves settled for second with Kardashian third. Josh Fierke put three Top Kart drivers inside the top-five while Jake Venberg (Merlin) placing fifth. It was a near sweep for Corey Towles, missing out on the fast time in qualifying before going on to dominate the remainder of Day 1 in LO206 Senior. The Comet Eagle kart driver made no questions about it, bringing out the broom to sweep the action on Day 2. Towles posted fast lap after fast lap in qualifying, posting a 46.471-lap without a draft to secure the pole position for the Prefinal. 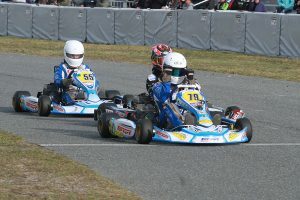 Leading all 12 laps, he set sail again in the main event to lead wire-to-wire in the main event for his fourth victory in two years at the Daytona KartWeek. The fight was for second again with Dustin Demattia (Keener) beating Zach Linsell (MGM) for the spot. Michael Greiner (Eagle) advanced from seventh to fourth while last year’s Junior winner Hunter Fox (Margay) came from 12th to fifth. The opening round was a battle for Tyler Gonzalez in the Woltjer Racing Engines Pro IAME Junior division. An eye issue forced a quick trip to the med center for Gonzalez Thursday morning, missing the qualifying session and unable to reach the checkered flag in the main event. With a new day brought a new chance to shine, and the Florida driver did. Gonzalez swept the action on the day, beginning with a blistering lap in qualifying (40.600) to better the field by three tenths of a second. He led all 12 laps of the Prefinal over third-year Junior driver Dylan Tavella (Tony Kart). Tavella got the jump on Gonzalez to lead the first six laps until Gonzalez moved back into the lead. From there, he pulled out to a 1.1-second advantage for his third WKA win dating back to the 2016 series finale in September. Tavella stood on the runner-up step of the podium for the second straight day while reigning champion Pauly Massimino (Top Kart) placed third. California driver Oliver Calvo (Top Kart) won the battle for fourth over Max Peichel (Tony Kart). Adding to the number of first time winners from yesterday, Elliott Budzinski (Tony Kart) earned his first WKA victory in the Comet Kart Sales Yamaha Junior category. It was a fight for the top position all day long, coming away from qualifying with the fast lap of 43.759 seconds, just 14 thousandths quicker than Emory Lyda (Merlin) with the top six separated by just six hundredths of a second. Budzinski came under pressure from last year’s winner Spike Kohlbecker as the Margay driver led laps until Budzinski reclaimed the top spot until the checkered flag. Tyler Ferris (Top Kart) made a late charge to finish second. The three established themselves as the top drivers in the Final, with Ferris slipping back to seventh before fighting his way back to third, and running down the top two. Budzinski led the first 13 laps until Kohlbecker challenged for the spot. This opened the door for Ferris to join the fight, as he took the point on lap 15 and led to the white flag. On the final lap, Budzinski secured the top spot, and held on to the checkered flag for the victory. Kohlbecker also slipped past Ferris to take second. 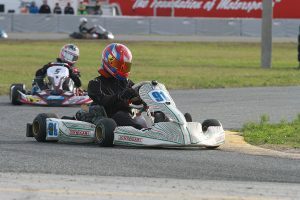 Trinity Karting Group’s Finnegan Bayliff (Tony Kart) placed fourth in his Daytona debut while Lyda ended the day in fifth. There was no predicting the action in the OTK USA Rok Shifter class. 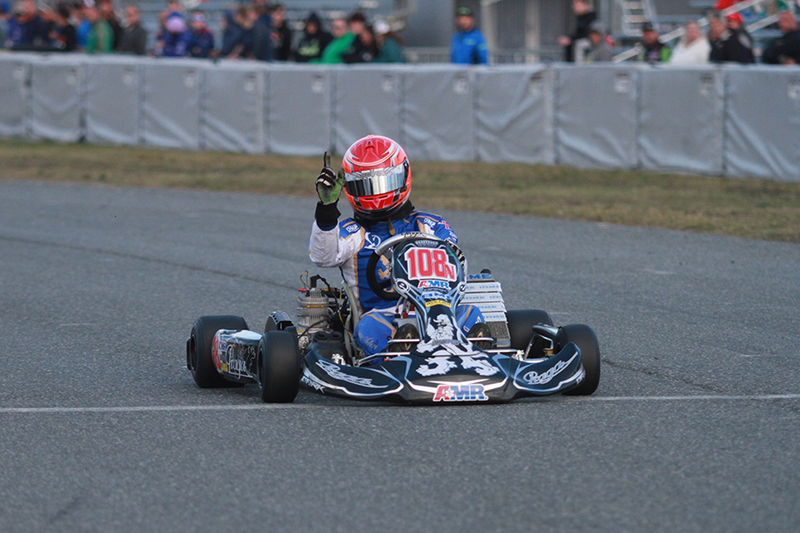 Vincenzo Sarracino (Tony Kart) became the second ever class winner with a sweep in Day 2. 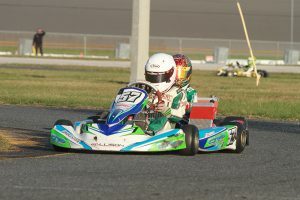 The Ocala Gran Prix driver edged out Michael Stevens (Tony Kart) by just 15 thousandths of a second in qualifying. They ran 1-2 in the Prefinal while Day 1 winner Jonathan Kotk (Top Kart) retired after one lap following contact with Rory Van der steur (FA Kart). The Final was one of attrition, with Stevens leading early ahead of Sarracino. Lap eight, Sarracino took over the lead while Kotyk closed to make it a three driver battle. Lap 12, Stevens and Kotyk made contact, sending both off the track and out of the race. This left Sarracino alone out front, scoring the victory while Ryan Lewis (Intrepid) was handed second. Stevens was awarded the third spot with no other drivers on track after the incident, putting Kotyk fourth and Andres Ceballos (FA Kart) fifth. Day 1 winner in the IAME USA East Pro Swift Sportsman Ashton Chilton (Tony Kart) looked to pull off another sweep on Day 2. Chilton edged out the field by 14 thousandths in qualifying and fought off Lucas Rodriguez (Benik) and Nicholas Terlecki (Merlin) for the Prefinal win. Terlecki looked to be the top challenger until he spun around at the opening corner, dropping to the tail of the field. Chilton jumped out to a solid lead until a slight mistake cost him the advantage, bringing a train of karts into the mix for the lead. Elio Giovane (Benik) took over the point for three laps until he was shuffled back to fourth. Chilton led while Giovane fought back, retaking the lead with two laps to go. Giovane drove away to score the victory with Chilton in second. Anderson Leonard (Nitro) drove to third with Granger Perra (Benik) advancing up to fourth from 11th with Brent Crews putting two Nitro Kart drivers inside the top-five. Throughout 2016, Garrett Adams was among the top Cadet drivers. Adams notched his first Daytona victory in the Allison Racing Engines Yamaha Sportsman class. Adams set fast time in qualifying and held off Sam Hinds (FA Kart) at the line for the Prefinal win. Adams led the first three laps of the main event until Brent Crews (Nitro Kart) took over the point. He remained there for six laps until Adams took back the position. Logan Adams (FA Kart) fought his way up to the second spot a lap later, and the two Comet Kart Sales drivers held the positions until the checkered flag for a 1-2 finish. Nick Snell (Benik) placed third with Day 1 winner William Robusto (CompKart) fourth and Anderson Leonard (Nitro) up from 11th to fifth. Mateo Rubio-Luengo (Kosmic) scored the victory in the CRPRacing.com Mini Swift category. Rubio-Luengo came away with the Prefinal win, and broke away from the field to lead all 20 laps for the victory. Alex Powell (Tony Kart) joined him on the podium in the runner-up spot with Calem Maloney (Formula K) earning another third place finish. Ben Maier (Nitro Kart) was fourth, just ahead of Jorge Ortiz (FA Kart) and Day 1 winner Caleb Gafrarar (Parolin).